They went mad. Or is that me? I must admit I’m listening to Disney’s “it’s a small world” and it’s messing with my head. I love it. It’s 13 minutes long. 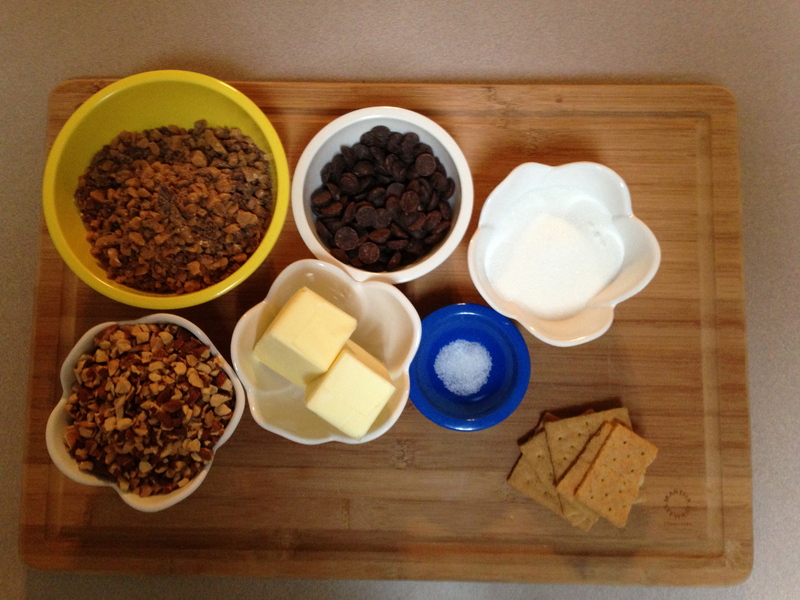 Step 1: Gather ingredients: Toffee bits, bittersweet chocolate, sugar, course salt, butter, toasted chopped almonds, graham crackers. Dolls kind of freak me out, but I can’t decide if the ones in “it’s a small world” are nice or are plotting my demise. 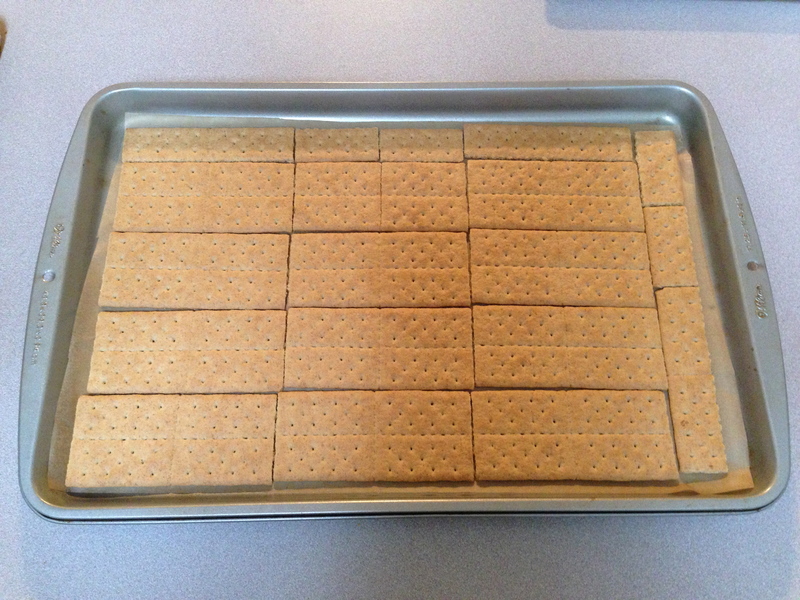 Step 2: Place graham crackers in a single layer on a sheet. Honey bee Lego minifig approves. Now the song has a really creepy laugh. They are plotting murder. 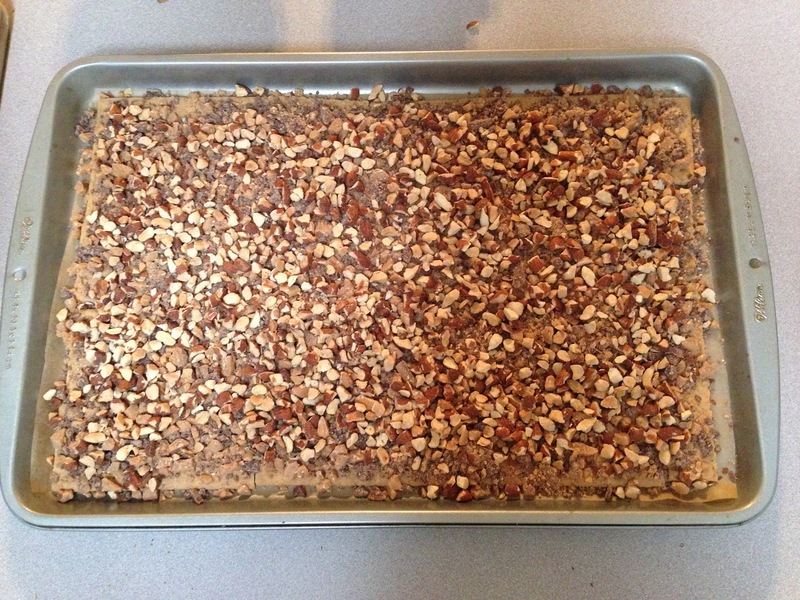 Step 3: Sprinkle toffee bits and almonds evenly over graham crackers. I can see how my parents used to hate this song, but it’s very educational. There are many different languages. F you, Rosetta Stone. I learned my world languages from 300 audio-animatronic dolls. 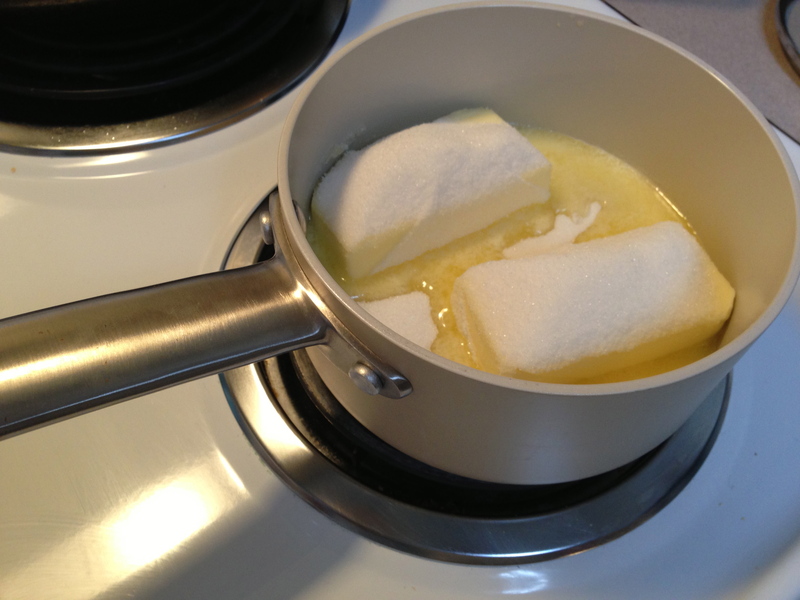 Step 4: Bring butter and sugar to a boil. This scared me. I’ve turned away from cooking sugar and turned back to black smoke. I kept my eye on it this time. 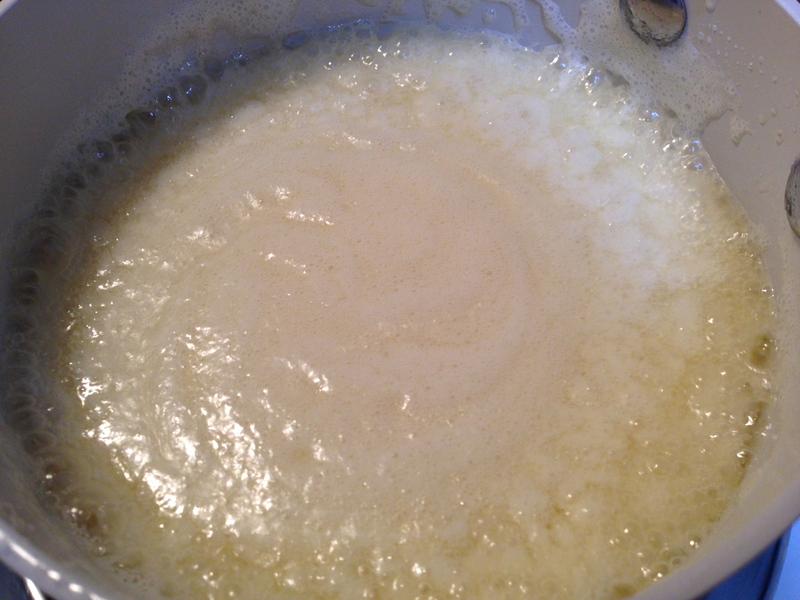 Step 5: Reduce heat and cook at a rapid simmer until mixture is syrupy. Ew. 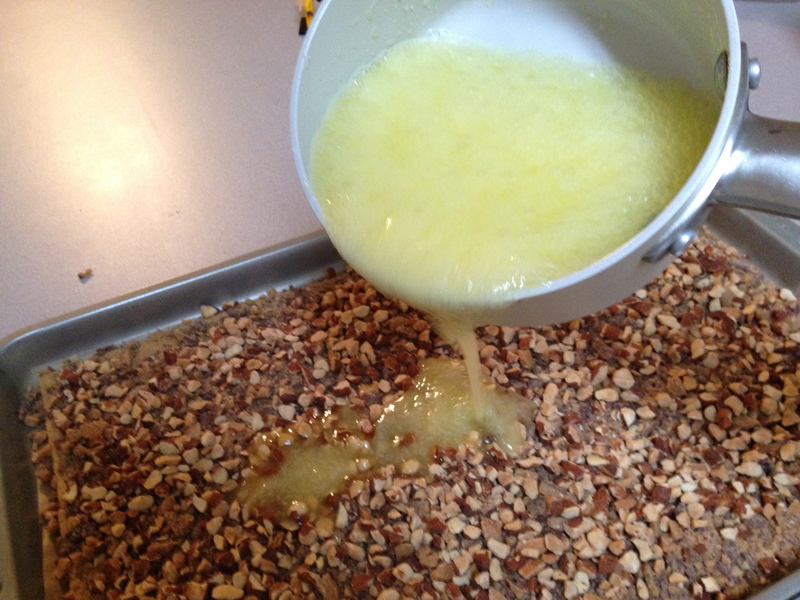 My kitchen smelled like butter. CALL PAULA! 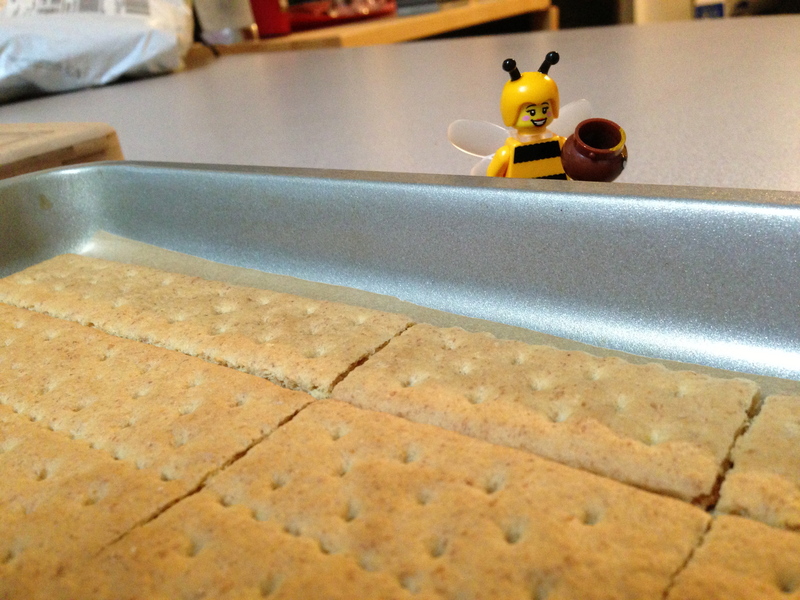 Step 6: Pour over graham crackers. Did you know that the ride is described as a “dark boat ride”? Dark from the deepest pit of your nightmares. 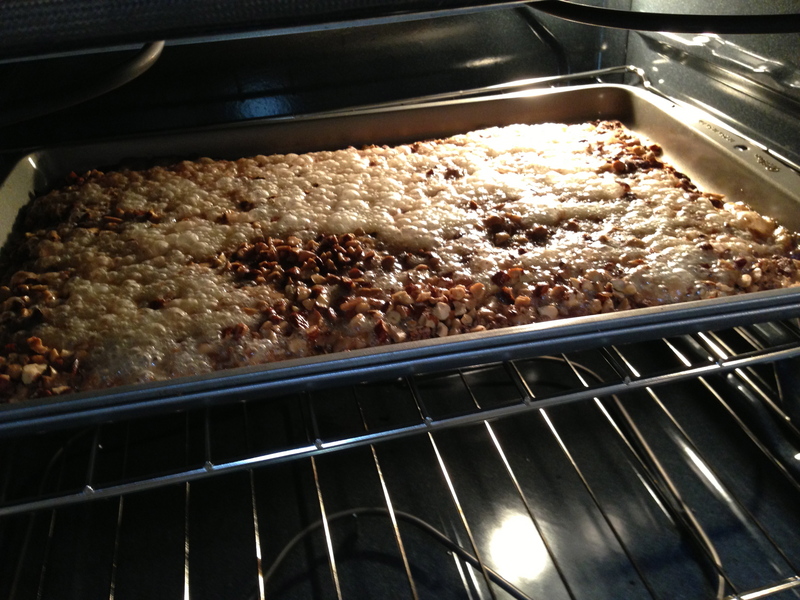 Step 7: Bake until sugar topping is bubbling. I think that’s bubbling enough. 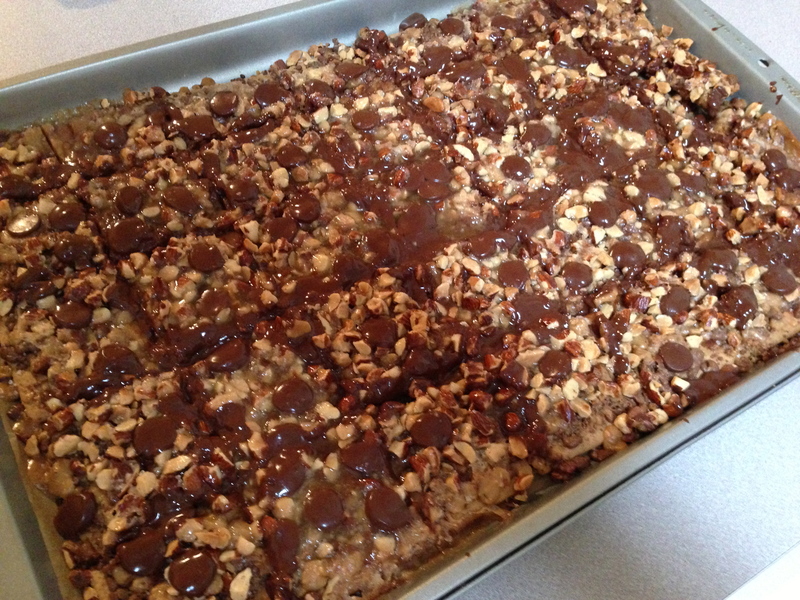 Step 8: Immediately sprinkle chocolate and salt evenly over graham crackers. 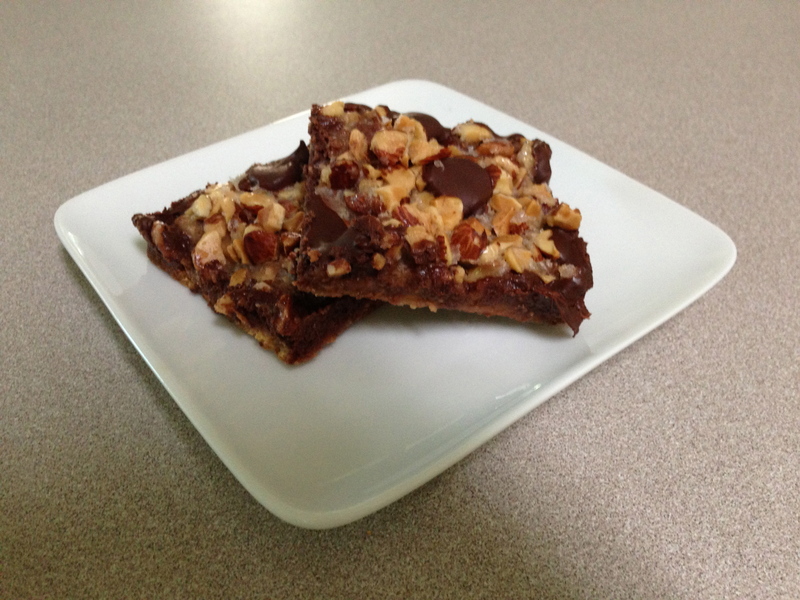 I’m glad I chose to use these big Ghirardelli chips instead of chopping a bar. This is prettier. 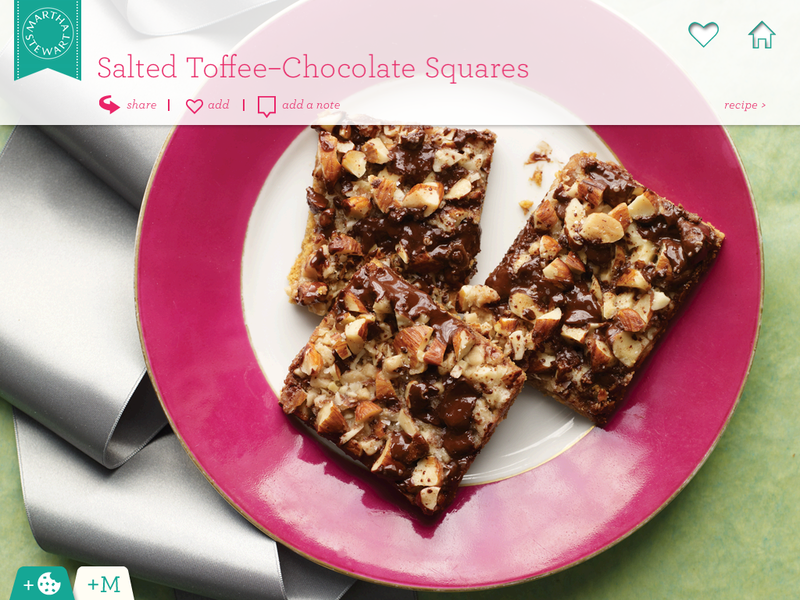 Step 9: Cut into 2-inch squares, let cool completely. betcha can’t eat just one. 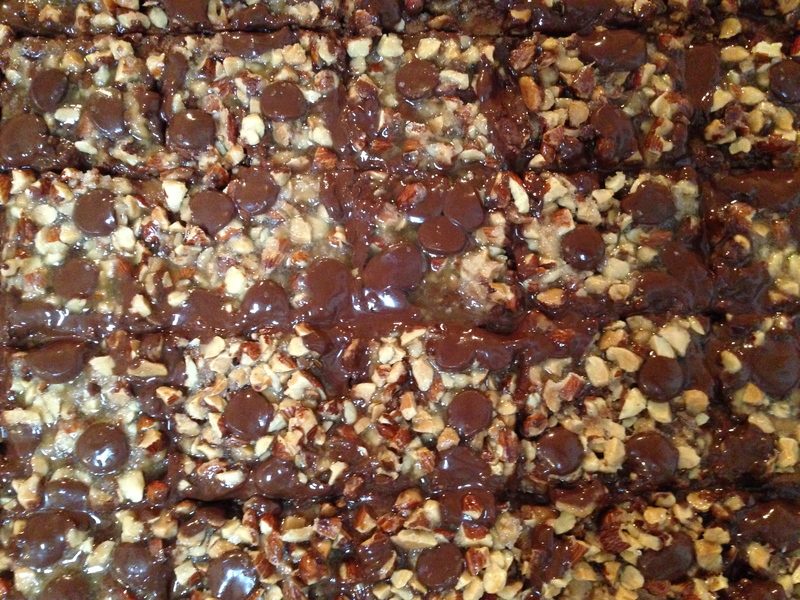 You’ll lose all inhibition and eat 5 like some people I know. How do I take down the clown dolls? Yes, I ate 5. I REGRET NOTHING, I’d do it again. We need to meet for some coffee or something. So I can get my cooks. Oh and you can meet Rowan, or whatever, too. 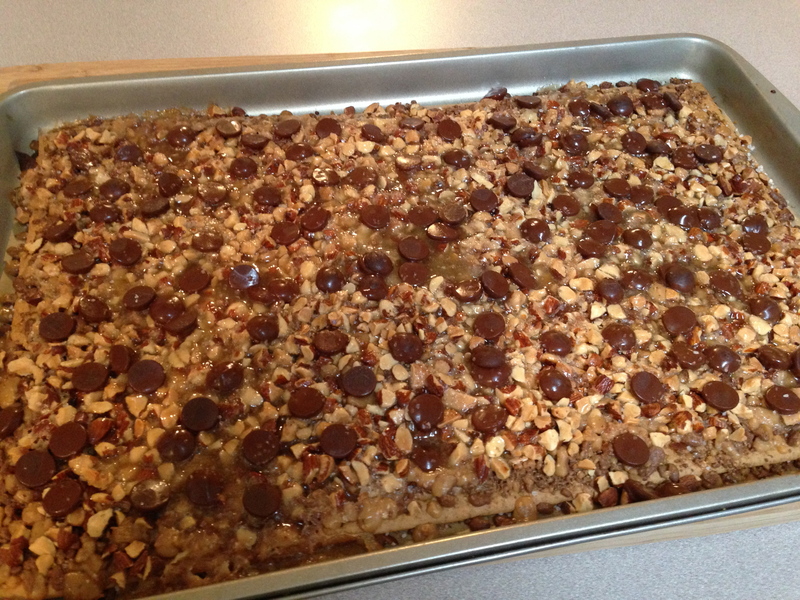 the assembly of these is interesting… but all the ingredients sound delightful, no wonder they were a big hit!